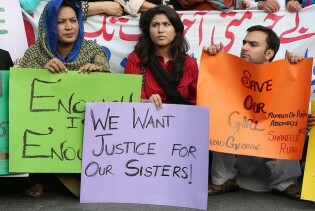 Amina Bibi, an 18-year-old from Pakistan’s Punjab province, was allegedly raped by four men on Jan. 5 this year. All the accused were granted bail. A desperate Amina set herself on fire outside a police station on Mar. 13 and succumbed to burn injuries the next day. Had the provincial governments of Pakistan heeded their apex court, the country’s four provinces - Punjab, Sindh, Balochistan and Khyber Pakhtunkhwa - would have had local governments in place by now. The Supreme Court of Pakistan had in July this year directed that local government elections be held by Sep. 15. Zahid Husain, 25, is a salesman in the Pakistan city Lahore. He sits idly on the pavement of a clothes shop and plays a game on his cell phone, oblivious to the changes in the city all around him. Flanked by loyalists, friends, journalists and excited family members, former Pakistani premier Mian Nawaz Sharif, head of the Pakistan Muslim League (PML-N), seemed relaxed on the night of the May 11 general elections. For 70-year-old Ghulam Fatima, the upcoming general elections on May 11 promise to be unlike any she has witnessed before in Pakistan. The European Union (EU) is Pakistan's largest trading partner, with overall trade between the two countries topping eight million euros in 2011. One does not always need a time machine to travel into the past – a visit to a typical brick kiln in Pakistan’s Punjab province is enough to evoke a time when human beings were traded like animals and slavery was rampant. As International Labour Day approaches, rights groups in Pakistan are redoubling their efforts to win freedom for six incarcerated union leaders in Faisalabad, the country’s textile hub, who are currently serving a combined jail term of 590 years for supposedly violating the country’s ‘anti-terror’ laws.